Make this Spinning Balloon Spider for your October birthday or Halloween decoration. 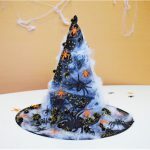 The spider will appear to be hanging from the ceiling from his web and looking up at your guests! Trivia: Spiders have 8 legs while insects have 6. Select two balloons of desired color. Inflate one to about 9 inches and the other to about 7 inches. Tie the two balloons together at the necks. Attach a ribbon to secure to a table or chair while working. Twist together 8, 12'' craft pipe cleaners to create 4, 24'' pipe cleaners. Wrap the pipe cleaners around the necks of the balloons at the knot leaving 4 ends sticking out on either side of the balloons. Bend the pipe cleaners down about 4 inches from the ends. Draw a hungry face on the top of the smaller balloon. Tape a length of white curling ribbon to the top of the larger balloon. Staple or pin the other end of the ribbon to the ceiling. Balloon Time is the leading brand of consumer helium balloon kits in North America. Balloon Time’s family of products includes Balloon Time 30 Helium Balloon Kit, Balloon Time 50 Helium Balloon Kit, Balloon Time A La Carte helium tank, Balloon Time Party Create-A-Face Sticker Kit and Balloon Time Party Foil Helium Balloon Kit. The helium balloon kits are available at a variety of retailers worldwide. 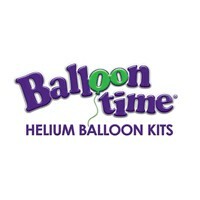 Visit BalloonTime.com to learn more about Balloon Time and its family of products or to locate a retailer.